Kazakhstan, to the North & North East. Azerbaijan on the Southern part of the Western shore including its capital Baku. The central Asian steppes to the north east. The Caucasus mountains on the border between Russia and Azerbaijan. The Garabogazköl on the eastern shore. Caspain Sea shore, Türkmenbaşy, Turkmenistan. Map of the Caspian Sea, yellow shading indicates Caspian drainage basin. A key problem is the status of the Caspian Sea and the establishment of the water boundaries among the five countries bordering the Caspian. Russia, Azerbaijan and Kazakhstan signed an agreement in 2003 to divide the northern 64% of the sea among themselves, although the other two bordering countries, Iran and Turkmenistan, did not agree to this. This is likely to result in the three agreeing nations proceeding with oil development regardless; Iranian and Turkmen development is likely to stall. At present, Azerbaijan and Kazakhstan have seen the biggest increase in oil production, an increase of 70% since 1992. Despite this, the region is still achieving less than potential output, with total regional production 1.6 million barrels (250,000 m³) per day, roughly equal to Brazil's production. This is expected to triple by 2010. According to a treaty signed between Persia (Iran) and Russia, the Caspian Sea is technically a lake and it is to be divided into two sectors (Persian and Russian), but the resources (then mainly fish) would be commonly shared. The line between the two sectors was to be seen as an international border in a common lake (like Lake Albert). Also the Russian sector was sub-divided into administrative sectors of the four littoral republics. After the dissolution of the Soviet Union not all of the newly independent states assumed continuation of the old treaty. At first Russia and Iran announced that they would continue to adhere to the old treaty (but they don't have a common border any more, so this is practically impossible). Kazakhstan, Azerbaijan and Turkmenistan announced that they do not consider themselves parties to this treaty. Later followed some proposals for common agreement between all littoral states about the status of the sea. Azerbaijan, Kazakhstan and Turkmenistan insisted that the sectors should be based on the median line, thus giving each state a share proportional to its Caspian coastline length. Also the sectors would form part of the sovereign territory of the particular state (thus making them international borders and also allowing each state to deal with all resources within its sector as it wishes unilaterally). Iran insisted that the sectors should be such that each state gets a 1/5th share of the whole Caspian Sea. This was advantageous to Iran, because it has a proportionally smaller coastline. Russia proposed a somewhat compromising solution: the seabed (and thus mineral resources) to be divided along sectoral lines (along the two above-described variants), the surface (and thus fishing rights) to be shared between all states (with the following variations: the whole surface to be commonly shared; each state to receive an exclusive zone and one single common zone in the center to be shared. The second variant is deemed not practical, because of the small size of the whole sea). Russia and Kazakhstan signed a treaty, according to which, they divide the northern part of the Caspian Sea between them into two sectors along the median line. Each sector is an exclusive zone of its state. Thus all resources, seabed and surface are exclusive to the particular state. Russia and Azerbaijan signed a similar treaty about their common border. Kazakhstan and Azerbaijan signed a similar treaty about their common border. Iran doesn't recognize the bilateral agreements between the other littoral states, but this has limited practical implications, because it doesn't have common borders with Russia and Kazakhstan. Also Iran continues to insist on a single multilateral agreement between all five littoral states (as the only way to achieve 1/5-th share). The position of Turkmenistan is unclear. After Russia adopted the median line sectoral division and the three treaties already signed between some littoral states this is looking like the realistic method for regulating the Caspian borders. The Russian sector is fully defined. The Kazakhstan sector is not fully defined, but is not disputed either. Azerbaijan's, Turkmenistan's and Iran's sectors are not fully defined. It is not clear if the issue of Volga-access to vessels from Azerbaijan and Kazakhstan is covered by their agreements with Russia and also what the conditions are for Volga-access for vessels from Turkmenistan and Iran. The last short-term sea-level cycle started with a sea-level fall of 3 m from 1929 to 1977, followed by a rise of 3 m from 1977 until 1995. Since then smaller oscillations have taken place. These changes have caused major environmental problems. The northern portion of the Caspian Sea freezes in winter, and in the coldest winters, ice will form at the south. Ekranoplan, the "Caspian Sea Monster"
^ van der Leeden, Troise, and Todd, eds., The Water Encyclopedia. Second Edition. Chelsea, MI: Lewis Publishers, 1990. page 196. ^ Caspian Sea » General background. CaspianEnvironment.org. Retrieved on 2007-05-25. ^ ESA: Observing the Earth - Earth from Space: The southern Caspian Sea. ESA.int. Retrieved on 2007-05-25. ^ Large Lakes of the World. Factmonster.com. The Caspian Sea is bordered on the west by Azerbaijan and Russia, on the northeast and east by Kazakhstan, on the east by Turkmenistan, and on the south by Iran. The Caspian coastline is irregular, with large gulfs on the east, including Krasnovodsk Gulf and the very shallow Garabogazköl Gulf, which acts as an evaporation basin and is the site of a major chemical plant that extracts salts from the deposits. 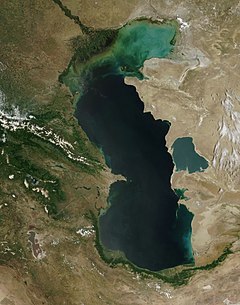 The southern and southwestern shorelines of the Caspian Sea are bordered by the Elburz Mountains and the Caucasus Mountains. It is bounded on the N by the South China Sea, on the N and E by the Pacific Ocean, and on the S and W by the Indian Ocean. Iran is bounded on the N by Armenia, Azerbaijan, Turkmenistan, and the Caspian Sea, on the E by Afghanistan and Pakistan, on the S by the Gulf of Oman and the Persian Gulf, on the W by Iraq, and on the NW by Turkey, with a total land boundary length of 5,440 km (3,380 mi). Situated off the eastern edge of the Asian continent, the Japanese archipelago is bounded on the N by the Sea of Okhotsk, on the E and S by the Pacific Ocean, on the SW by the East China Sea, and on the W by the Sea of Japan.